You probably know that Yonex is one of the biggest names in the world of badminton. And in this opportunity we are going to review the Yonex Arcsaber 10. Is this a good or bad racket? The question is simple, and this review will let you see if it’s a good choice for you. It’s a wise idea to check the advantages and disadvantages of this racquet, so you can get a proper and quick overview. Superior control. Coupled with a solid feel, the Arcsaber offers you the complete pack. Perfect for defenders. It’s fast, accurate and solid, everything a defender needs. Superbly well-rounded. Serving, clears, net play and more, there’s nothing this racket cannot do. As you can see it’s an amazing product. Not for nothing many call it one of best badminton rackets, and it’s used by several professional players like Peter Gade, Taufik Hidayat and Tony Gunawan. If you are medium-level or expert player looking for an edge over your rivals, then the Arcsaber 10 can bring you that thanks to its superior control, extreme maneuverability and well-rounded features. Want to know more about it? Worry not, because right below you will find a more complete and detailed revision. A racket must be good and visually attractive as well, and the Arcsaber 10 fills all the voids. 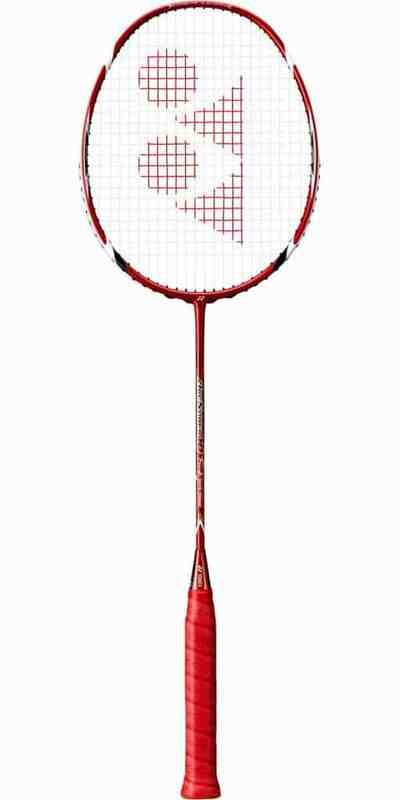 Its bright red color along with cool graphics make it a beautiful racket, and you could not expect less from Yonex. From a design perspective, it’s an excellent product. But let’s review its construction to see why it’s a great option for you. The stringing (BG80) is pretty tight and feels very well. You may need some time to get used to the timing, but once you do, it’s going to feel incredible. Moreover, as it’s strung this way it’s easier to test right off the bat. It has a stiff shaft. It brings you several advantages: Faster speed (especially in the replies), excellent shuttle placement, better balance and more powerful swings. Built-in T-piece. Many rackets don’t include it, but the Arcsaber 10 comes with it which brings you a superior lateral strength and a better performance. High Modulus Graphite plus Cup-Stack Carbon Nanotube. This wonderful combination grants you the possibility to execute pretty strong and accurate shots with plenty of repulsion power and flexibility. And finally its isometric head shape comes with an enlarged sweet-spot, which means you will get more successful shots in comparison to average rackets. It is a very well-rounded racket which excels in speed and control. It makes it perfect for defensive-style players thanks to the extreme maneuverability and superior control. In these aspects it’s clearly superior to the Yonex Nanoray 900. It allows you to react very fast, that’s why I recommend you this racket if you are a defensive-style player. It can perform pretty good smashes, although, you cannot compare it to the power of the Yonex Voltric 80. Nonetheless, with some lead tape in the head you can get more power at the expense of defense. The Arcsaber 10 is a close rival to Yonex Nanospeed 9900, but I believe it is superior when it comes to smashes. Both of them are super-fast, offer a superior control and solid feel and are great in densive play, but when it comes to smashing power the Arcsaber 10 wins the game. Serving with this racket feels very good thanks to its incredible accuracy. And you can really feel it when serving low, that’s where this racket excels and over-delivers. If you are a fan of flick serves, then this racket will leave you totally satisfied. Although dominating it requires of excellent footwork and plenty of experience, the right racket will bring you an edge over your competitors. The control is vital for net play, and the Yonex Arcsaber 10 brings you plenty of it. From a defensive perspective net lifts go with easy and accuracy. Meanwhile net kills go with plenty of power and accuracy. If you have all the skills yet you see that your net play needs some help, then you may not be the problem, but your racket. And this one will solve that problem quite well. Now you should have a pretty good and solid opinion on what this racket can do. And yes, the Yonex Arcsaber 10 is an excellent racket, one of the best in the world. It’s intended for advanced players who want to take their game to the next level.